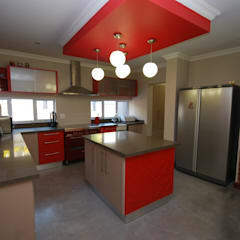 When hearing the term ‘built-in kitchen’ (or ‘built-in appliances’, as South Africans call them), we immediately imagine a kitchen with the necessary appliances (microwave, oven, etc.) literally built into the cabinets – meaning they can’t be as easily removed as loose-standing ones. This is especially popular where people are renting, such as flats/apartments. 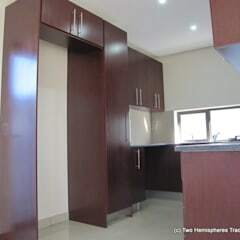 These types of designs are also ideal for smaller homes with minimal space. · Portable: Often referred to as ‘freestanding’, these machines are completely transportable, making them easy to position in a variety of ways. · Slide-in: This is usually where confusion sets in. Though you may have a refrigerator seemingly built into the kitchen, it’s probably a portable unit that’s simply slid into a pre-existing nook. Although it seems permanent, it’s actually transportable. · Built-in construction: Units are literally fixed into place, such as a wall-oven or stovetops installed into the actual countertops. Certain devices, like dishwashers, are usually built into a kitchen to make them look sharper and simpler to use. In modern kitchens, microwaves have become a common built-in appliance installation. By building the microwave into the cabinetry, it’s no longer taking up valuable space on the countertop. 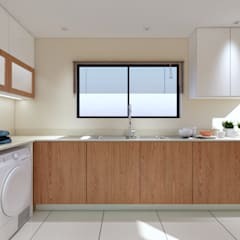 Modern-day kitchen designs tend to hide away washing machines. 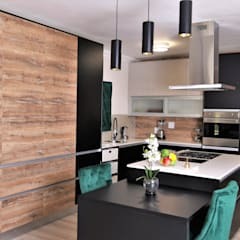 Although they were usually hidden away in a closet or separate room, a lot of contemporary kitchens are seeing them neatly fitted below countertops to create more usable areas. 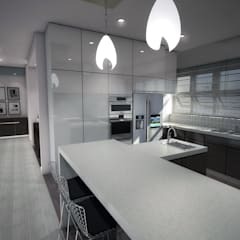 Fridges are also being built into kitchens more often, helping to optimise space and create cabinets above and below, while smaller units could simply be slipped into a cabinet. What are the pros and cons of built-in kitchens? 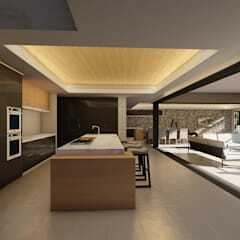 · Modern kitchen designs with built-in appliances look trendy and elegant. 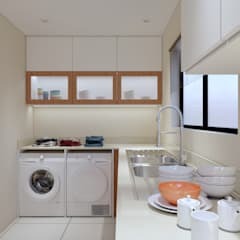 · Built-in appliances are ergonomic, compact, functional and practical. 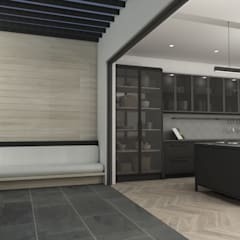 · A visually integrated look (some built-in fridges even allow you to install custom door panels to match your kitchen’s cabinetry). 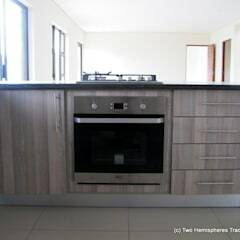 · When it comes to separate built-in ovens and cook tops, you can install a gas cook top and electric wall oven. 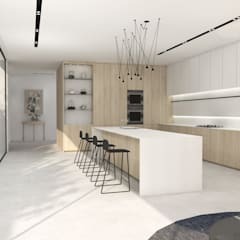 · Appliances blend in neatly with the cabinetry, almost becoming invisible, nicely keeping the focus on the quality of the kitchen itself. 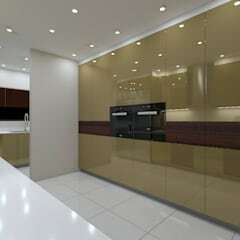 · Built-in kitchen appliances are the best choice for small kitchen interiors. 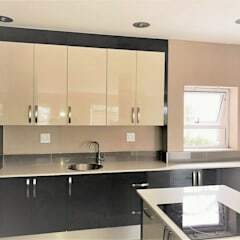 · It’s ideal for open-plan living. 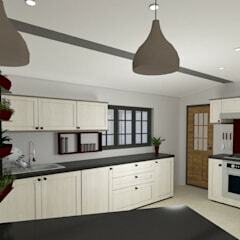 More and more houses and apartments are built with small kitchenettes and living rooms combined. 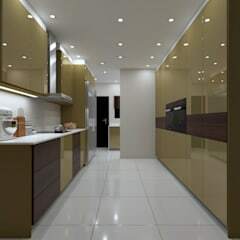 Such an integrated design will ensure that your kitchen doesn’t jar with your living room’s look. 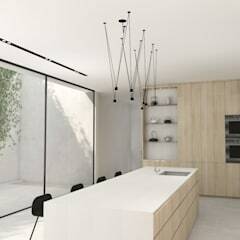 · It improves culinary activities. 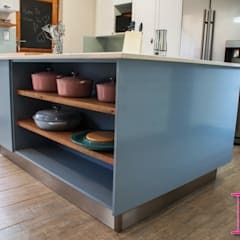 If you have a kitchen with an island unit, cooking enthusiasts might appreciate a built-under oven, meaning that after heating up a dish, it can be taken out and put straight onto the worktop above. 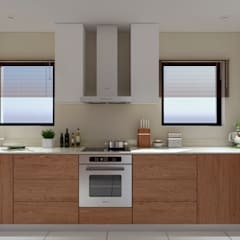 In addition, built-in ovens can be positioned higher in the wall, making it easier to access and check on your cooking. · It’s easier to keep clean. 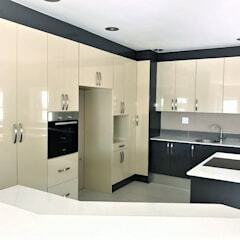 A built-in kitchen’s seamless design minimises difficult nooks and crannies where dust and dirt can accumulate, meaning a kitchen that’s both easier to clean and more hygienic. 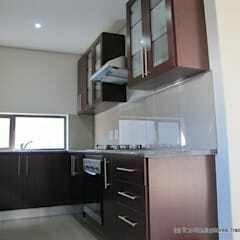 · The costs of products and installation are generally higher than free-standing appliances. · Due to the integrated nature of the products, you are less likely to update your appliances to keep them in line with modern upgrades. 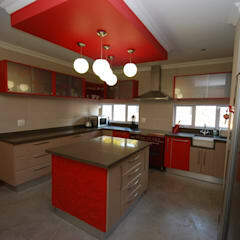 · Changing the designs or appliances thereafter can be quite costly, plus it will impact the cabinetry. 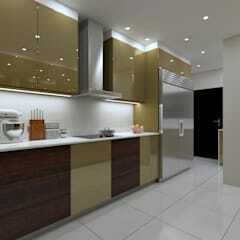 · It is harder to repair broken appliances built into kitchen cabinets. What are the materials and costs involved with built-in kitchens? 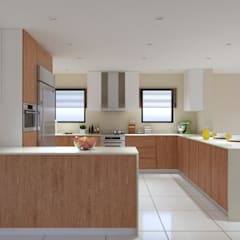 No single price exists for built-in kitchen designs; options vary depending on kitchen size and style, supplier, region, type of appliance, etc. 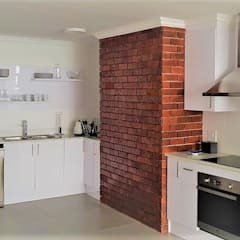 A built-in multifunction oven from a leading South African brand, for example, can range from R5,600 to R16,400 (excluding VAT). · Melamine (cost-effective, easy to clean, hardwearing). · Solid wood (expensive depending on type of wood, ideal for custom carpentry). 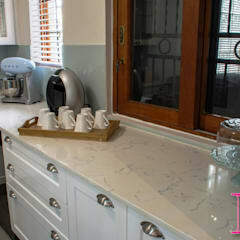 · Marble (very costly due to their elegant appearance). 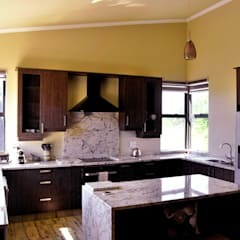 · Granite (more cost-effective than marble, also a beautiful choice for a natural material). 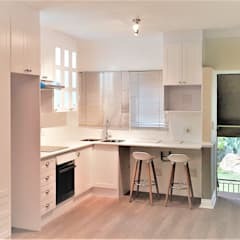 What are my seating options with a built-in kitchen? 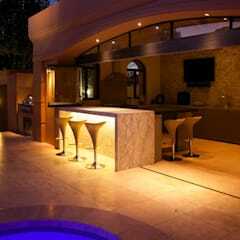 · Bar stools set up against a counter/peninsula, transforming it into a breakfast bar. · Window seats located in bay recesses can enjoy their own little corner unit. · Bench seating is perfect for saving space, as more people can be grouped together. · More space-saving methods have introduced hinged tables mounted to the wall with folding chairs. 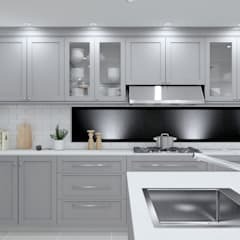 Can I have cabinetry for built-in appliances? 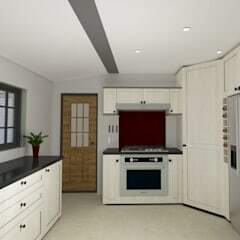 · As a fridge is generally the biggest item in any kitchen, it’s recommended to design your cabinets around it first. 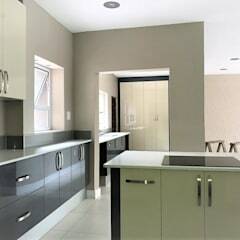 · If possible, always opt for a built-in microwave as well, freeing up some counter space. 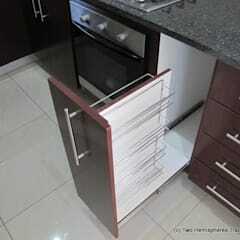 · An extra cupboard for your toaster and coffee maker couldn’t hurt. · Enhance your kitchen’s neat look by storing away all small appliances (like blenders).